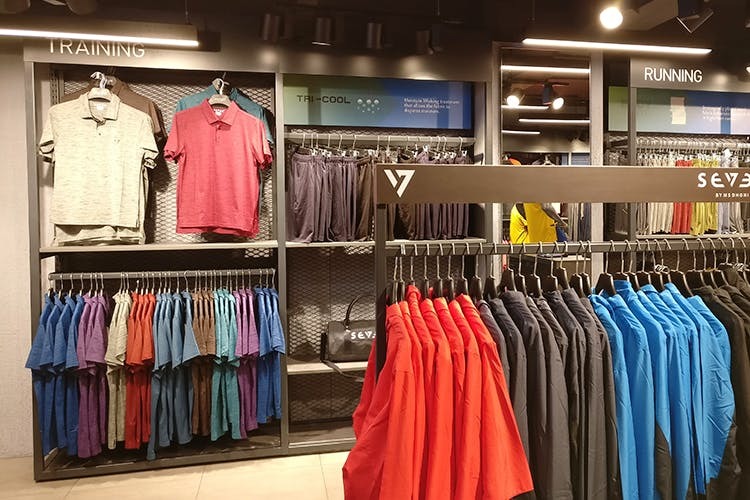 MS Dhoni’s own, official CSK merchandise brand, Seven launched its first store in earlier this year, on Nungambakkam High Road and we went to check it out! Started by MS Dhoni, Seven is the official merchandise partner for CSK and makes jerseys for them. Their store is the only place in the city where you can buy 100% original CSK merchandise and has been super popular because of it, but more about them later. The first thing we noticed as we entered their shop on Nungambakkam High Road was how sharp it looked. It felt like any other Nike and Adidas showroom, with its strongly contrasting colours, svelte lighting, and impeccably neat interiors. Not having heard about the brand until recently, we didn’t know what to expect apart from CSK jerseys. We were blown away to find everything from windcheaters to joggers, vests, training jerseys, polos and so much more. We especially like the classic colour scheme they followed of simple single or double colour pieces, with none of that colour mishmash stuff that you find at Nike or Adidas stores. The best buys that we found were their classy black and blue training jacket (INR 2,500) and their dry fit training jerseys (INR 600). Moving away from the apparel section, there’s sports shoes and flip flops available. Like the clothes, they looked really sweet and were affordably priced too. They even had their version of Converse’s Chuck Taylors, for just INR 2,500! While we liked a lot of what we saw, we would like to point out that we didn’t like that the women’s section was a fraction of the size of the men’s. For CSK fans, the jerseys are there and they look great, but because they’re original they’re expensive; each one costs INR 2,000. Cricketers, there’s also Dhoni’s own line of cricketing apparel you have to be excited about, with everything from cricket shoes to classic white tracks. Thala Tees & CSK Jerseys: Dhoni's Own Sports Store Opens In Nungambakkam!